The Cenobites are extra-dimensional beings from the mind and works of Clive Barker. They appear in the novella The Hellbound Heart as well as its semi-sequel The Scarlet Gospels and nine Hellraiser films. They are also mentioned, Clive Barker’s book Weaveworld, in which they are referred to as “The Surgeons”. Cenobite means “a member of a communal religious order” The Hellbound Heart specifies that they are members of The Order of the Gash. Which is a call out to how the cenobites have mutilated themselves with various cuts and body modifications. They have hooks in themselves and clothing that’s stitched to their bodies. Truly they are horrific beings. Their Engineer (leader) is described as even having her pubis disfigured. The Cenobites vary in number, appearance, and motivations between movies, comics, and books. 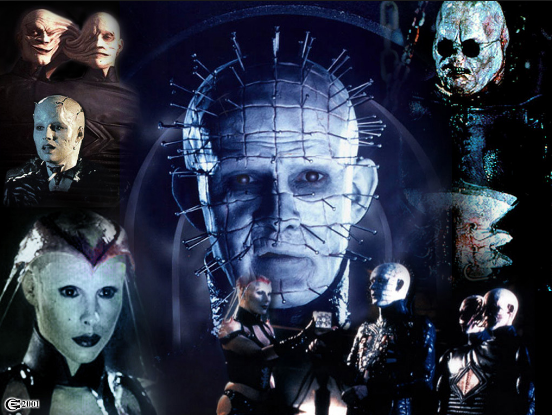 The involvement of multiple parties in the production of Hellraiser films and comics (mostly with the creative supervision of Clive Barker) has led to varying levels of consistency regarding their philosophies and abilities. The only consistency between all versions of the cenobites are of ritually mutilated people with varying degrees of human characteristics, and that they can only reach Earth’s reality through a schism in time and space, which is opened and closed using an innocuous-looking puzzle box called the Lament Configuration.